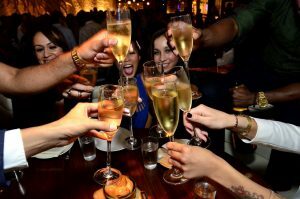 Featuring a Premium Open Bar, a Champagne Toast, Live DJ and More at STK Atlanta! This New Year’s Eve, join Midtown’s sexiest steakhouse for an unforgettable New Year’s celebration ball on Sunday, December 31, 2017. Known for its high-energy atmosphere, STK will take luxe to the next level during its New Year’s Eve Ball. Partygoers invited to enjoy a selection of seasonal specials created by Executive Chef Andrea Montobbio from 5:30 p.m. to 10:30 p.m., and take advantage of a three-hour premium open bar beginning at 9 p.m. Music for the evening will be provided by DJ Ree de la Vega and revelers will be treated to complimentary New Year’s Eve party favors, a champagne toast at midnight, and much more. Dinner reservations are also available without the premium bar tickets for a $100 minimum per person. General admission tickets are $75 and VIP tickets are $120 for ages 21 and up. VIP partygoers will also receive a bottle of Veuve Clicquot per four guests. To purchase tickets to STK’s New Year’s Eve Ball, visit: https://www.xorbia.com/e/stkatlanta/nye-ball-2018. For more information about STK, visit www.stkhouse.com or call 404-793-0144.